I see a lot of people on Howrse asking about thus or getting locked in the game play forum for asking this, so I thought it was time I did a little tutorial. This method only works on Windows computers! Apple products don't do this, to the best of my knowledge. 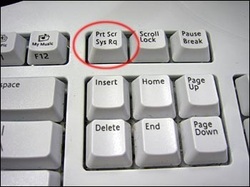 On your keyboard you'll see a button, in some obscure corner, called Prt Sc, or Print Sc, or Prt Screen, or Prt Scr Sys Rq, or some other such bizarre letter combo that doesn't appear to mean anything. Everyone calls it the Print Screen button. Pressing the print screen button is the easiest way, but also the biggest trade off. Basically, get all your ducks in a row and press Prt Sc and it copies everything on your screen, including your task bar and your browser tabs and everything, to your clipboard in an image file. Owely is the original program of mine, I've used it for as as long as I can remember as my family has. It's a very nice time tested tool, it does have its draw backs though. It's available for Windows 2000 or newer, And also Mac and Linux, but I can't view the system requirements for those OS because I'm on a Windows 7. :p It is free and totally safe, but your antivirus may freak out the first time you run it (and/or firewall, My Comodo Firewall and Avast Antivirus had a stroke the first time I used it, on my XP and 7) but it's a false positive- don't worry. If you wanna check for yourself Kim Komando recommends it and if she says it's safe it likely is. You can go to this website to learn more or download but in general, Owely must be launched every time you turn your computer off all the way. I keep him pinned to my task bar and start menu... anyway when launched he appears in your system tray (by the time in the bottom right)and you'll have to access your settings to make him appear all the time (click the little arrow in the system tray and click customize). 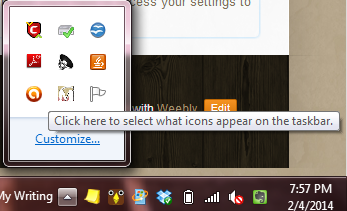 When Owely is in the task bar, you can just right click on him select either "Capture Screen" (which will get everything on your screen, task bar and all) or "Capture Region" (which will allow you to click and drag to select a section). Then you can do things like draw a square, arrows, text, or just draw. While Owely is a great program, it's somewhat limited and it's text option leaves some to be desired... which is why it's only my #2 choice. Evernote is an amazing program for writing that is free and lets you sync your writing so you can access it ANYWHERE. You can also get a web browser extension called The Evernote Web Clipper. You can get it for Chrome, Safari, Opera, Firefox, and it comes pre installed with Evernote for Internet Explorer. Evernote is free and useful, and the Webclipper Screenshot tool is an amazing option. The pros: It's free, easy, offers the blur option which no other does, gives very "professional" results. the cons: You have to have Evernote (which I highly recommend anyway, you have no idea how many times I have used to help me with TBH). Click Here For The Clipper!